14 year old boys vary a lot in what they and their friends like to do. 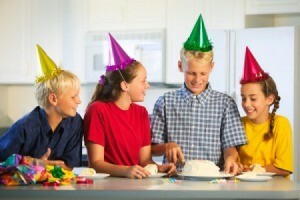 Planning a birthday party for this age group can be overwhelming for the parents and the teen. This is a guide about 14th birthday party ideas for boys. My son is turning 14 and I have no money. How can I make this day fun for him? Find some sort of event or activity that costs very little. There may be something free that you can have him invite his friends to, and they can all go together. Maybe you can take them so a beach or something. Maybe just have a group go to the park and play ultimate Frisbee or soccer or whatever they might like. If you can afford a wiener roast, have that after they have enjoyed some games. If you cannot, perhaps just cake and drinks. Try the website "freecycle.org" to find a chapter in your area. People on there give away all kinds of stuff from clothing to gift stuff to furniture... it's free! Collect up a bunch of items and have a scavenger hunt where they have to find the items you got, and hid all over the place, or you can hide cards from a deck from the dollar store and each card can correspond with a wrapped prize (wrapped with flyers and newspapers) you got for free. Hide them in your yard or house, or at the park. The wiener roast is pretty cheap... with a home made cake or cup cakes. They sell food at the dollar store. Have fun. Teen boys are generally pretty simple; they want to do something with their friends. For most boys, this is what matters. I'm a scout leader and it's pretty universal. My son's birthday party consisted of hot dogs, chips, fruit, cookies, and cupcakes. They had soda or water to drink. The boys played video games, roughoused, and played Magic. I made it a sleepover until 10am the next day. No decorations or frills. My son and the boys had a blast. All I did was food and drink. Total cost? $110.00. I have to keep reminding myself that all the boys want to do is be with each other. I am putting up a tent near the house. I did this last year and they played video games till dark and then went outside and stayed up most the night rough housing and eating junk food. Chips and pop mostly.